Hey guys! How is everyone’s Tuesday going? Mine started off slow with a few cups of coffee consumed. I think J has finally gotten used to the time change as he is finally waking up to his normal 7 am – he was not a happy camper waking up at 6, and neither was I. A few hours later I made a satisfying bowl of oats! Heart healthy and oh so good! I am very glad to see you liking my cookie recipe from yesterday! I wouldn’t;t lie to you: they are GOOD! AND easy to make! 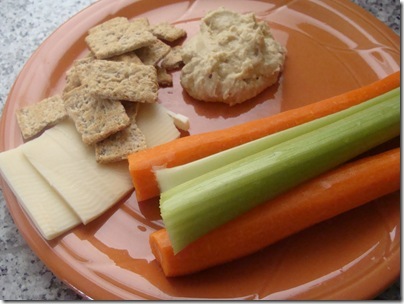 Lunch was super simple: carrots, celery, hummus, Kashi crackers and mozzarella slices. simple is the best! those oats look so godo! 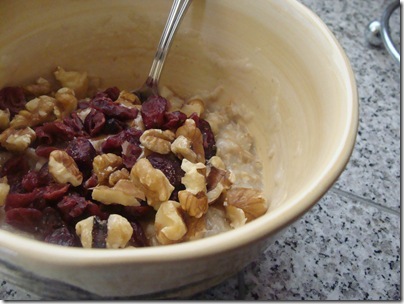 I really like the cranberry/walnut combo with oats. Very appropriate for fall! Naomi gave up her 2nd nap at around 10 months, it was so hard on me! haha! I am lucky though, most days she is good for at least a 2 1/2 – 3 hour nap at around 1pm everyday. NOT looking forward to the day the one and only nap is dropped!